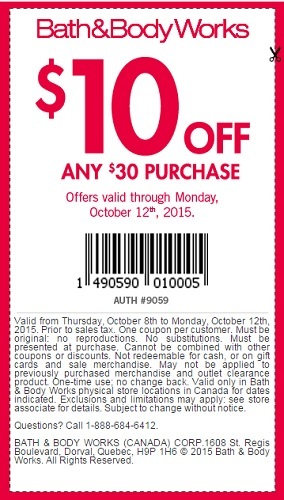 Bath & Body Works Canada has prepared a special sale coupon for you! The coupon allows you to take $10 off any $30 or more purchase! No substitutions. The coupon must be presented at purchase. Cannot be combined with other coupons or discounts. The offer is valid at Canadian Bath & Body Works stores. The offer ends today Monday, October 12, 2015. Official source of the information is Bath & Body Works Canada. More details about the promotion available at Canadian stores.